The Itty Bitty Kitty Committee: We're Excited! Aren't We, Wylla? We're Excited! Aren't We, Wylla? The Internet Cat Video Fest is only one week from today and we're getting very excited! The Grand Cinema started with one screening of movie, which immediately sold out, then added another, and another, and another, and another. I guess there are lots of kitty lovers here in Tacoma! As it stands, all of the evening screenings where Wylla will be present (6:30, 6:45, 7:00, and 7:10) have booked up, but if you would still like to see the movie, there are tickets available for the afternoon matinee shows (2:00 and 4:15) and just a few left for the 8:55 PM. Now that I think about it, if you have tickets for the 4:15 screening, we should be there and set up by the time you're leaving the show, so you'll be able to catch us on the way out! We'll be set up in the lobby, so please pop over and say "hi' to Wylla! She'll be sitting in the miniature lobby set I built for the Fest and will be happy to receive your love and take a photo with you. I'm planning on having IBKC posters, Sparkle Balls, books, and cards available for purchase at our table, too. The Humane Society will be there as well. They'll be accepting pet food donations for the shelter's Emergency Pet Food Bank, so please bring a can, bag, or a case to support this awesome program! So, tell me, who's coming to the show? We're really looking forward to meeting all of you!!!! It's always so great meeting people from the IBKC community and I love being able to match faces with the names I see commenting on the blog. For more info on the Fest you can visit this BLOG POST and to purchase tickets, click HERE. Oh, how I wish I lived in the Tacoma area so I could come meet Wylla! Those are two things I love a lot: cats and movies. Also wishing that I lived in the area so I could stop by. Larry and Lisa from Kenneth's family will be there. We can't wait to meet Wylla! I remember Kenneth Wiggins! I am sure he is a big beautiful boy now! Would love to see a current picture of him and his cat buddy! Quick! 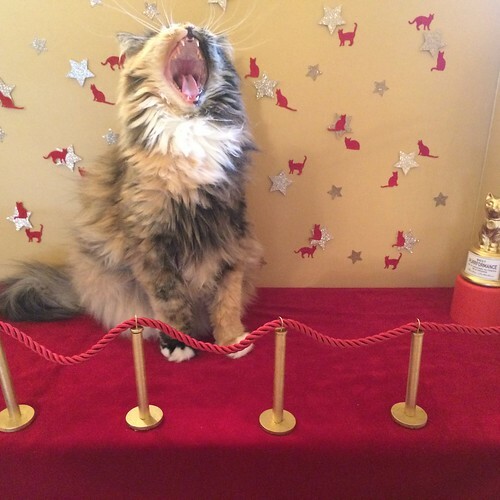 Someone photoshop Wylla's roar into the MGM logo! I was hoping to be working so I could attend. But your trailer for the Fest was fab - I recognized those ear lashes! We've already put the huge bag of cat food into Alex's car!! See you there! Yay!! Got my happy ticket for the 6:45 screening the day they went on sale ~ can't wait! Oh, I wish it was on the East Coast! The trailers were just HILARIOUS! I hope it's amazingly successful. I so wish I could be there to see the movie and meet you and Wylla! :( Ah, well. I look forward to pictures and your account of the event. I hope everyone who does get there, and is able to meet you and Wylla, has a wonderful time. We will be there, can't wait!